Melrose Park, IL - AMS Metal Slitting, a quality toll coil-processing center located in a western suburb of Chicago, has installed a new high-production Automatic Slit Coil Packaging Line to efficiently package slit coils produced by its large slitting lines. 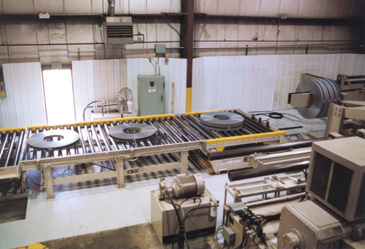 The Packaging Line, designed to automatically handle slit coils weighing up to 15,000 lbs. 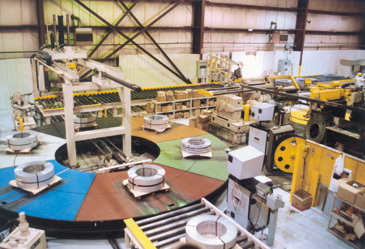 and up to 84" diameter, was custom engineered to allow two large slitting lines to discharge coils directly onto a power conveyor system feeding into a Power Strapping Machine and an Automatic Coil Stacker. The new system was designed and manufactured by Coiltech Corporation, Schiller Park, IL. Slit coils produced by the pair of slitting lines are discharged onto Turnstiles, which in turn are unloaded by a pair of Slit Coil Downenders. Each Downender is capable of handling slit coils from 1" to 24" wide. The line attendant enters the slit coil complement data into the Downender controller. Once programmed, the Downender travels out to the Turnstile arm, extends its coil arbor to the width of that particular slit coil, lifts the coil off the Turnstile arm, returns to the starting position with the coil, downends the coil onto powered rollers in the eye axis vertical position, discharges the coil, and once the coil is clear, returns to the Turnstile to retrieve the next coil. The coil retrieval cycle is completely automatic and operatorless. The separated and downended slit coils are automatically advanced to the semi-automatic Slit Coil Strapping Machine where multiple 3/4" steel strapping is radially applied to the coil. Coils are manipulated for strapping by three powered conical rolls. An M20 Signode strapping head mounted in a parallelogram balance frame applies strapping in a semi-automatic manner. After strapping is applied to the coil, it is advanced into the Automatic Coil Stacker where the coil is centered, gripped by the Stacker's hydraulic coil grab, and transported and stacked onto a pallet positioned on a six station Turntable. 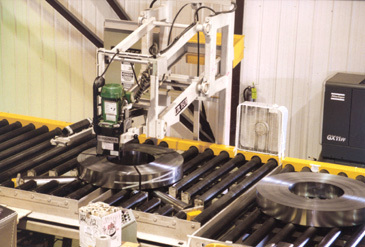 The Stacker secures the coil by both ID and OD, lifts the coil off the centering table, transports the coil to the stacking position, then gently deposits the coil onto a pallet or coil package. The coil stacking cycle is fast, but gentle enough that "spacer" sticks placed onto the coil at the Strapping Machine are not disturbed or displaced. Coils are stacked directly onto the preceding coil, generating a straight and neat coil package.